The Dell PowerEdge T630 Gen13 offers exceptional integrated management tools, and the ability to rack mount as a 5U server. Designed for SMBs and front office deployments, the Dell T630 server is ideal for standard uses such as file, print, web server but is also an excellent choice for database, and online transaction processing. 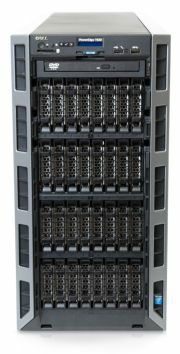 The Dell T630 tower server features Intel's C610 chipset. Administrators can choose from either Xeon E5-2600 v3 or Xeon E5-2600 v4 processors. It supports a few different chassis configurations depending on your needs for performance or storage or both. DDR4 memory delivers faster processing and enhanced energy efficiency especially when used with the v4 processors which support transfer speeds of up to 2400MT/s. Choose from either Registered or Load Reduced DIMMs to populate up to 24 memory slots. With all 24 DIMM slots loaded with 64GB memory modules, up to 1.5 Terabytes is available. A minimal configuration with a single processor can run with just one 2GB memory module but clearly with that setup there's a great deal of room to scale. Supporting up to 32x2.5-inch drives or 18x3.5-inch drives, this tower server gives administrators options for performance or storage when choosing a system. Multi-mode RAID options and in-server storage tiering optimize performance for VMware vSAN and Microsoft Storage Spaces. Ample drive space supports both entry-level and performance options however you should determine your current and future needs as switching configurations at a later date is a complex task. Dell's cost-effective optional PERC controllers can also boost storage performance. With eight PCIe slots, including a mix of PCIe 3.0 and PCIe 2.0, there's room for a multitude of external devices including NICs, HBAs, and GPUs. For even more processing power or VDI deployments the system can support up to four optional 300W internal graphics processing accelerators. Management is handled by iDRAC8 with Lifecycle Controller and Dell's OpenManage portfolio of systems management solutions including the OpenManage Essentials console. The iDRAC8 controller is embedded on the motherboard and enables out of band system management even when the system is powered off. Upgrading to iDRAC8 Enterprise enables remote access using a browser. The Dell PowerEdge T630 tower server is highly adaptable and will excel at just about any task, given the dense storage and memory this system is capable of supporting. It's a solid performer for both general purpose and high performance computing. SMBs will appreciate the potential of the system to grow with their changing needs over time and the ability to mount the system in a rack enclosure.